The strategic plan for the Ethical Culture Fieldston School (ECFS) in Bronx, New York, included a 48,000 sq. ft. middle school academic building and an athletic facility (38,000 sq. ft. gym/fieldhouse and 12,000 sq. ft. natatorium). 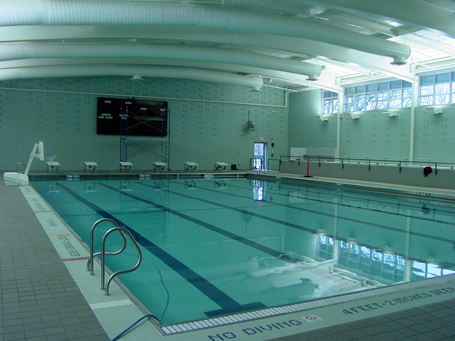 Counsilman-Hunsaker, in association with Cooper Robertson & Partners, designed the aquatic facility for the middle school, which includes an indoor six lane 25-yard competition pool with starting blocks and clerestory windows. The facility not only capitalized on available space for recreation use on the Fieldston campus, but also reflected the school’s goal to educate, inspire, and motivate. In late September, ECFS received the exciting news that the Fieldston Middle School had been awarded a Silver rating by the U.S. Green Building Council, making it the first new school building in New York City to be LEED certified. Green features include two vegetative roofs, one used for teaching purposes; stones quarried from the site used on the exterior; windows that can be opened; certified wood used at the entrance; native plants; low-flush toilets, waterless urinals, water-saving showers, and motion-activated sink spigots.